The Universidad de Chile had a nice gesture with the historical players of the "Azul ballet". The club gave them all 2019 tickets so that they could accompany the team in the stadium. Among the honors was the historic Blues shooter: Carlos Campos, who also celebrated his birthday. 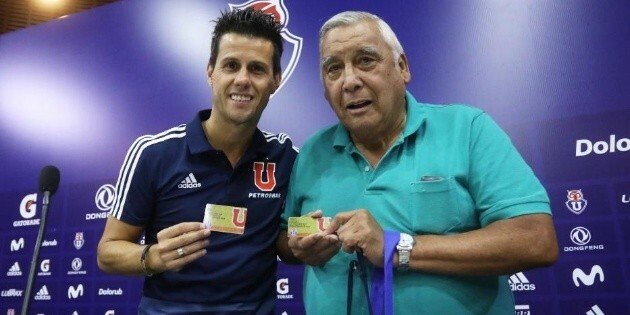 El Tanque, at the age of 81, is a loyal fan of the team and is constantly on the pitch. But one detail drew attention in the publication of the club on its Twitter account as "subliminal" news for its arch-rival Colo-Colo: "Don Carlos Campos, real" tank ". Esteban Paredes is also known under the pseudonym "Tank", so the publication of blue is subtly directed to the albos, which means that the first and only "tank" will be a blue shooter.